""Baloon Main phassay ho tum ""
""Tumhain Kangee say nikaloon gaa""
""Kangee say na niklay tou""
"" Main TIND kara loon gaa""
once there was a non muslim and a muslim.they both were friends.the non muslim asked the muslim that i want to go some where.tell me a place.he said that u can go to IRAQ.he said no i dont want to go there because there are many muslim there.then the muslim told the non muslim that he could go to iran and he replied the same.then he said that u can go to pakistan.he replied that that place is infected with muslims.the muslim bacame angry and replied that:""u can go to HELL,U WONT FIND ANY MUSLIMS THERE. meri "Jaan" tujh se gila nahi. Wo Shakhs itna "Bura" nahi. Ye meri Wafa Ka "Sila" nahi. Tu ne aaj tak wo "Parha" nahi. Phone Na Kiya Kro . 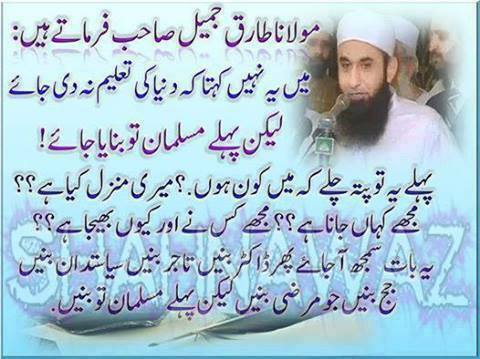 Phone Na Kiya Kro "DEAR"
Papa Se Lgta Hai "FEAR"
Dewaro Ke Bhi Hote Hy "EAR"
Maulana Tariq Jamil Sahab Farmate Hain.